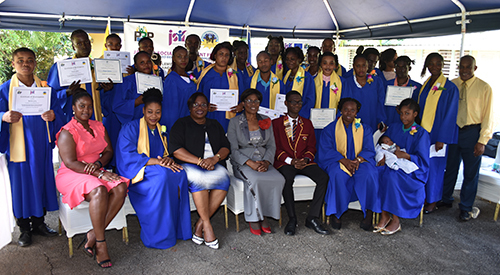 Orayon Williams and Bevaneisha Hewitt emerged as Valedictorians at the closing out ceremony of the six-month-long Behaviour Change Programme sponsored by the Jamaica Social Investment Fund and the European Union, administered by the Family and Parenting Centre. The closing out ceremony saw 27 at-risk young people from the communities of Granville and Tucker in St. James completing the programme, which was crafted to divert them from crime and violence that could potentially impact the community. 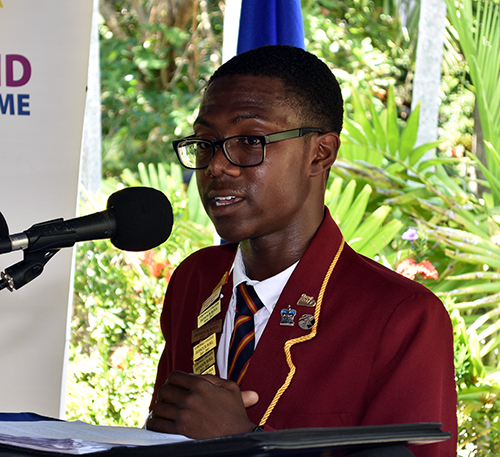 YOUTH LEADER SPEAKS: Rashaun Stewart, Head Boy of Cornwall College and former Junior Mayor of Montego Bay, addresses the graduates at the closing out Ceremony for the six-month-long Behaviour Change Programme administered by the Family and Parenting centre. The programme was jointly sponsored by the Jamaica Social Investment Fund and the European Union. Mona Sue Ho – Social Development Manager of Jamaica Social investment Fund, brought greetings on behalf of the sponsoring agency. Guest Speaker, Rashaun Stewart, Head Boy of Cornwall College, and former Junior Mayor of Montego Bay, in issuing his charge to the graduates, encouraged them to forge ahead on a platform of excellence that that they have been granted through the programme. “You are the cornerstones of the future. Fate exerts no control over you. You dictate your terms to fate. That is why you need to remember that ten-letter word: dedication. Never sway from your path. Carve a path to the future with your ironclad will,” he said. Stewart also encouraged them to embrace the opportunities for self-development that the advancement of technology now presents to them. “You are the world; you are the future. The future rests in your hands. With the advent of technology and globalization, the generation gap has never been wider than it currently is – and it continues to increase. The current generation exists in the golden age of technology, where new and improved technological devices develop almost daily. Never before has the future been as bright as it is now,” Stewart said. For his part, Williams said the programme had equipped them to become change agents within their communities, and improved their capacity to achieve. His counterpart Hewitt said through the programme, they had received education and training which had made them prepared to undertake whatever challenge they had to face. Executive Director of the Family and Parenting Centre, Dr. Beverly Scott, who gave an update, highlighted that the six-month programme engaged the participants in Remedial Education, Life Skills Training, Self-Esteem building, Anger Management, Conflict Resolution and Peace Building. “The programme was very inclusive. It involved letter writing, resume writing and interviewing skills and vocational skills including, barbering, hairdressing sewing, soft furnishing and apprenticeship. I am happy that these persons are now trained and certified, which empowers them to function effectively in the society,” Scott said.